Moist, chocolate sponge smothered with velvety Belgian dark chocolate sauce. The smell of warm chocolate is the ultimate lure for many of us. 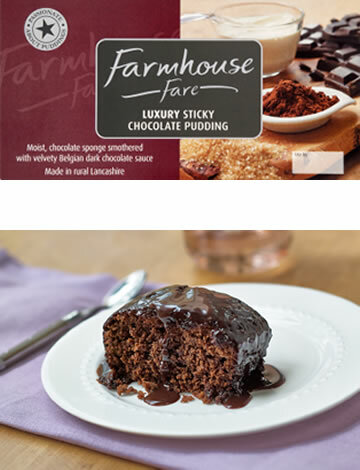 So for chocolate lovers everywhere we've taken our fabulous sticky pudding recipe which is rich, gooey and moreish; then we've drenched it in our decadent chocolate sauce that uses the finest Belgian chocolate. Perfect for those occasions when only chocolate will do. Sponge (58%), Belgian dark chocolate sauce (42%). For allergens, see the ingredients in bold and underlined. All ovens vary so please adjust accordingly. For best results heat in the oven. Always ensure pudding is piping hot before serving. Do not reheat once cooled.